The Nike Dunk is one of the most iconic sneakers ever, and is also Nike SB’s first model launched to create the extremely successful skateboarding program and brand it is today. The Dunk was the perfect model to start the SB brand because it offers endless design possibilities and as a result, the shoe is a go-to choice for most SB collaborations. Although the Dunk has always been in the SB program, the success decreased with the rise of new slimmer models like the Blazer and Janoski. So…it only makes sense to slim down the dunk as well and combine it’s elements with one of the best skaters in the industry to re-introduce the success story. The larger the Nike SB program has grown, the more skaters there are on the team that are noteworthy of deserving their own pro models. However, a Nike shoe with your name on it is so hard to achieve that only the very special team members get the chance. We can pretty much all agree that Ishod Wair deserves to have his name on a shoe. He’s won the 2013 Skater of the Year award, competes in Street League with other heavy hitters, and still makes time to film and release amazing video parts etc. From his work ethic, it’s no wonder that he’d get his own edition the Dunk, the Dunk Low Pro Ishod Wair. 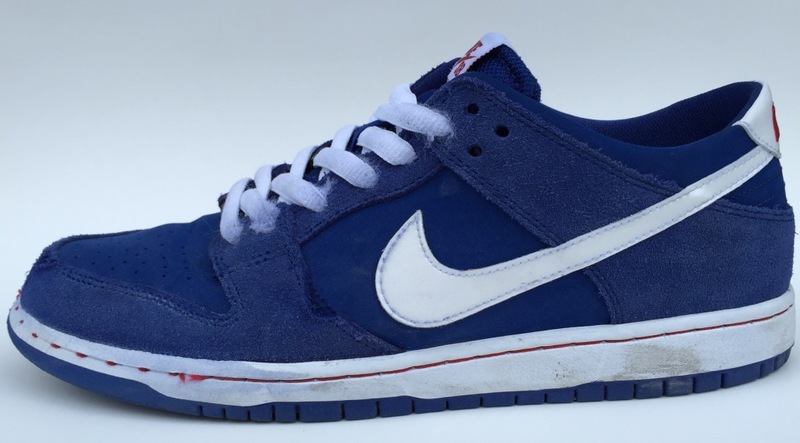 The Nike SB Dunk Ishod Wair fits true to size. Overall, the durability of the Nike SB Dunk IW is good. Skateshoes with rubber protected or seamless one-piece toe caps, often have exceptional durability. The Dunk IW, however, does not have either; there are some important seams that hold the shoe together that are visible in the toe area. Thus, there are inevitable first signs of wear and holes after skating 10 hours but, the most attacked area is still adequately protected. The suede used in the shoe left us a good impression, being made of high quality, which compensates for the flaw in having seams in the toe area. It’s also important to note that the positioning of the swoosh is good because it is positioned more towards the heel area which helps decrease the probability of the swoosh detaching or falling off once the seams holding it to the shoe have been ripped. The sole itself showed fantastic durability. No slick spots appeared, and judging by the deep thread pattern it’s quite unlikely that some would show up anytime soon. 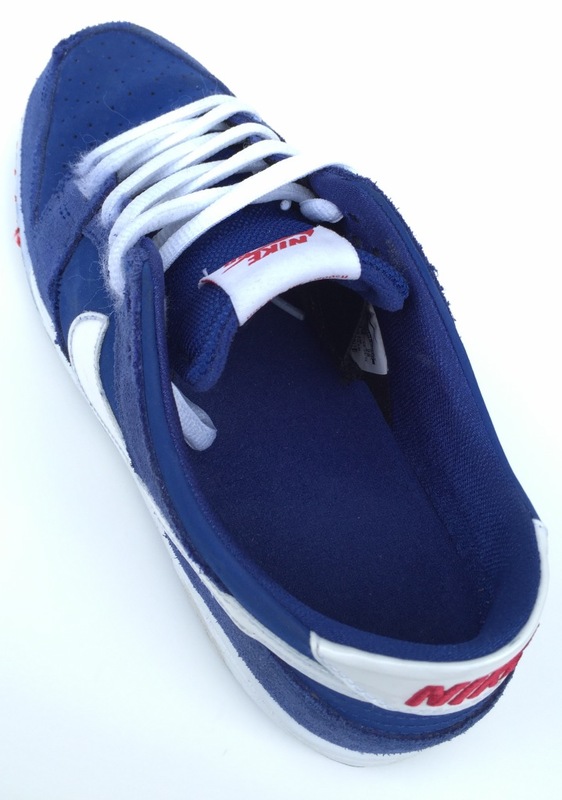 The Nike SB Dunk Ishod Wair is well-suited for high-impact skating and the cushioning is excellent. Similar to the P-Rod 9, Nike is not using their patented Lunarlon technology, but instead, uses the Zoom Air cushioning technology. The developers at Nike adapted the Zoom technology and added a unit in the sockliner which creates the cushioning. The use of these cushioning elements enables it to dampen harsh landings and bails extremely well. The cushioning capabilities can already be felt from just walking or just pushing in the shoe. The feet feel well protected and safe in Ishod’s new Dunk. 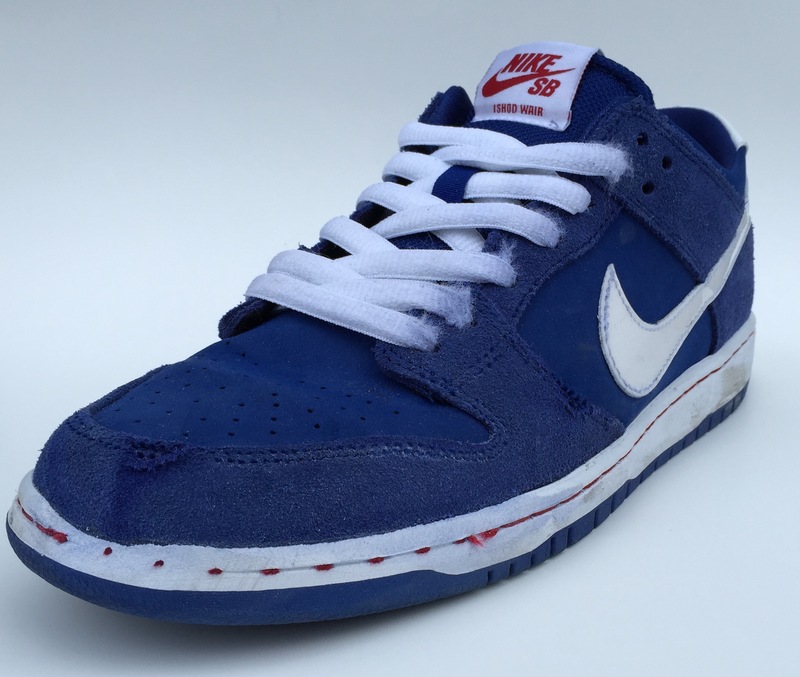 As shown in the pictures, the Nike SB Dunk is extremely slimmed down compared to the classic SB Dunk. In general the shape is cut rather slim in the mid foot, toe as well as heel area. The toe area especially, is cut very tight, which helps ensure a safe and secure feeling. The shape is rather parallel, ending in a stump toe area and a blunt tip. Boardfeel of the Dunk Ishod Wair is good and grip is average. The boardfeeling is good because the sole is not too thick and thus there is not much material between foot and board. Also the toe are is slimmer compared to the heel area which creates the excellent cushioning and a solid boardfeel. The grip is evaluated as average because the sole does not really develop the necessary flexibility to enable the shoe to mold into the concave creating a direct boardfeel. The inner lining of the Dunk is a very good feature of the shoe with regards to comfort. As a result, comfort is good and the stability is excellent. The Dunk Ishod Wair has an internal fit system which makes sure there are no pressure points. The slim fit as well as the combination of suede and synthetic material offers the perfect combination of minimal padding with a great heel lock and stability. As mentioned before the stability of the model is excellent. In the beginning the shoe is quite stiff but gradually loses this stiffness to a certain degree – this in return, creates the perfect stability afterwards but can be uncomfortable at first. The Nike SB slimmed down Ishod Wair Dunk Pro has outstanding stability and offers superior cushioning due to the Zoom Air bag technology. Another advantage is the durability of the shoe. Despite being very supportive for high-impact skating, the boardfeel, grip and the stiffness of the shoe have potential for improvement.